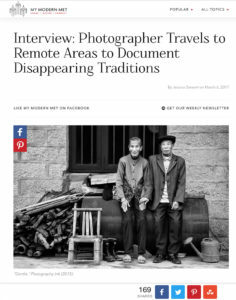 2017 Rfotofolio: Oliver Klink Selected as one of the artists! July 9, 2017 – Rfotofolio announces their 2017 Artist Selection. We are pleased to share that your work was selected in the 2017 Rfotofolio Call as one of the Rfotofolio selections. Thank you for sharing your work. We will be in touch for an interview in the coming weeks. Artists Reception at Mundos Cafe: Fantastic turn out! It was fantastic to see so many people at the Artists Reception. The place was packed with photo aficionado, admiring the work of three photographers traveling to the same place and displaying exciting images. Their style is uniquely different but all the images make you want to travel to these locations. The richness of India is amazing! Mundos Cafe is the perfect place for the exhibit and reception. The atmosphere is welcoming and the food is truly rated as one of the best sandwich places in the Monterey Bay. https://www.yelp.com/biz/mundos-sandwich-and-burger-house-monterey. The show is up until August 11. Don’t miss it! How did the show come together? The show, “Spirits of India”, came together as a result of Chester and Mary joining the travel photography workshops (www.incredibletravelphotos.com) organized by Oliver to discover “hidden gems” of India. Traveling for a few weeks at a time, we discovered how the rich history of India is still vividly present in their culture and daily life. 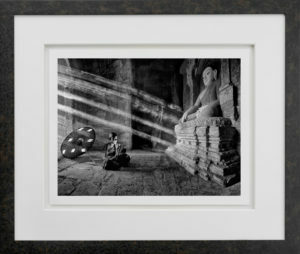 The focus of our photographic endeavor was influenced by the book “A Passage to India” by E.M. Forster, who makes frequent references to animals in India. These animals gave impetus for growth, served as a conduit of love and unity and symbolized Indian culture. Through the variety of animals portrayed in this novel, we begin to comprehend the complexity and spirit of India itself. “Spirits of India” is a compilation of images of Elephants and Marwari Horses, depicted in various artistic styles. Chester’s journalistic views of the cultural interaction between man and beast draw the viewer in; Mary’s equine photography expertise (www.maryaiu.com) give the viewer the feel of the power of the animals and their unique inward-turning ear tips; and Oliver’s fine art representation (www.oliverklinkphotography.com) ties the historical India with the joyful bound of humans and animals. Collectively, we were inspired by past and present stories of these two animals and concerned about what the future holds for them. How did the venue come to be chosen? When we first discussed the concept of the show, we were very interested in displaying our images at a venue, where it was accessible to everybody, a place where people come regularly, where they eat, where they mingle with friends, where they share their stories, where they create a “local” culture. The idea was to find a local venue that is an extension of our theme. Chester came with the idea of Mundos Café. The location, owns by Fernando Mundos, caters to regular customers who enjoy the food, the atmosphere, and camaraderie. The exhibition space is conducive to discussion and return visits as the place is open daily from 10AM – 7PM (5PM on weekends). The more time you see “Spirits of India” the more subtleties you will notice in the work, the interconnections between the three artists, their though process. The show transports you to a subconscious level, where you can feel the spirits of the animals. All three artists have been extensively exhibited, with shows at the Center for Photographic Art (Carmel), Pacific Grove Art Center (Pacific Grove), Carmel Foundation Gallery (Carmel), various galleries in San Francisco, Hayward, Palo Alto and San Jose, and even as far as Sacramento, New York, Buenos Aires, Paris, Switzerland. 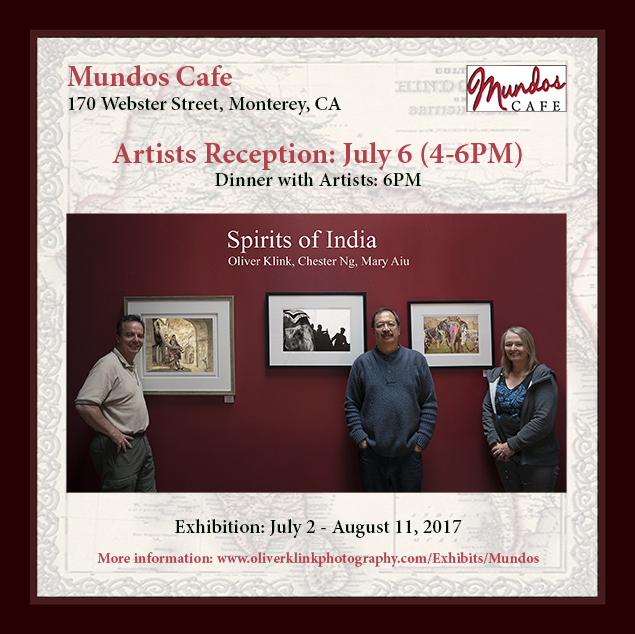 We are very proud of premiering the “Spirits of India” at Mundos Café. Why these two animal subjects? 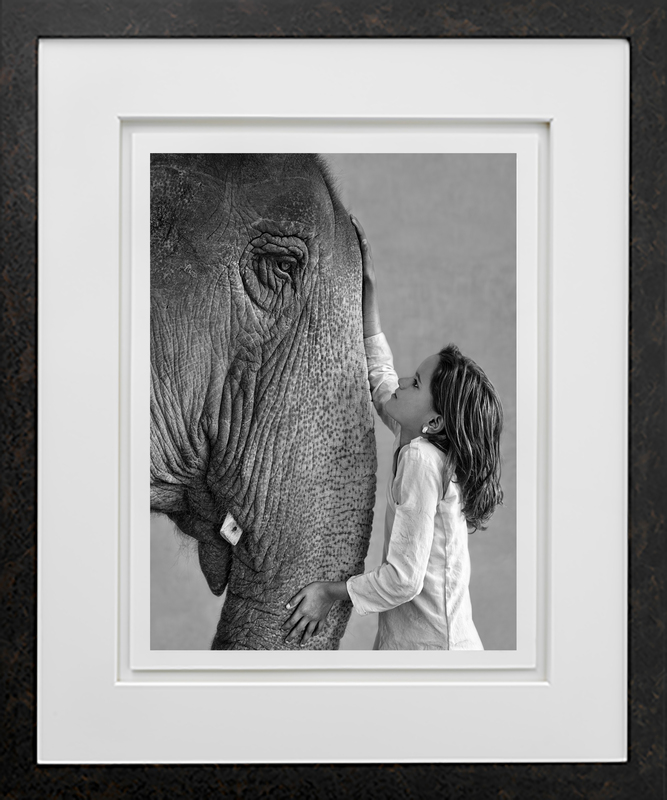 Elephants are the preeminent symbols of strength, wisdom, intelligence and royalty. In the 4,000 years since domestication, elephants significantly shaped human history in areas ranging from warfare, religion and culture to the economy. They have been worshiped in the Hindu religion and throughout the folktales of Ganesh, the elephant-headed God of wisdom and intellect. As in the Ganesh folktale, the survival of elephants is in great danger due to the pressures from hunting, habitat loss and other human–elephant conflicts. From an historical context, their cultural stature today seems diminished as well. Are these animals, once adorned in regality, now simply reduced to a commercial role in tourism? The Marwari horses are still revered in the India culture. Native to the Marwari region (Rajasthan, India), the Marwari horse is a rare breed known for its hardiness. A descendant of native Indian ponies crossed with Arabian horses, the Marwari are uniquely recognized by their inward-turning ear tips. Historically the horses were used to combat elephants and were also instrumental in shaping Indian history. Their breeding followed such a strict selective process that they were referred to as divine beings, known on the battlefield for their bravery and loyalty. After near extinction following the arrival of the British in India in the early 1600’s, the Marwari horses are now making a comeback. What does their future hold for them? We share the beauty of these animals and the connection that still exists between these magnificent beasts and mankind. Our hope is their existence will continue to thrive as we share this planet as one. 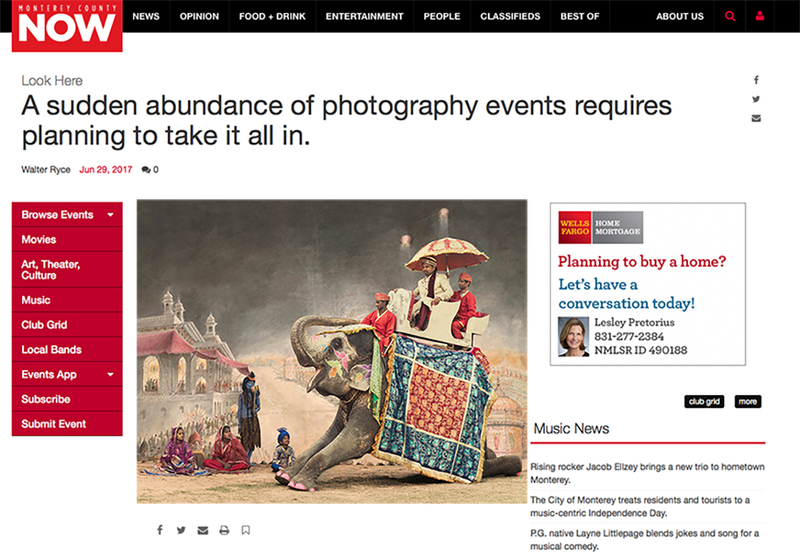 Mary Aiu of Carmel photographs horses around the world as the basis for photomontages. Oliver Klink of Los Gatos uses physics to capture light, our ecosystems and the modern world. Chester Ng of Monterey focuses on dance, motion, abstract and cultural themes. The three of them convened on a tour of India and brought back something of the spirit and history of the place by photographing elephants and Marwari horses. This is that show, in a venue that was formerly an art gallery and is still conducive to art. 4-5pm Thu, July 6, artists reception; 170 Webster St., Monterey, 920-1400. As a fine art photographer, I try to evoke feelings, to make images that are much bigger than us. For the image Javeena and Ganesha, the impact of strong bond between animals and humans, the meaning of the future of young girls in developing countries, the pure love and respect for each other, and so much more was deeply felt. But nothing could fulfill the acceptance of the image as much as the following quote from Sameen: “I wish I could have told you yesterday how much your photos of Javeena and Ganesha touched me. I couldn’t, because everytime I tried to talk about it, I was overwhelmed by emotion and was going to cry. I am not sure what it is about your work that touched me so strongly. I have never experienced that before when looking at anyone’s art. But there is something you have managed to capture that had a profound impact on me. Thank you Sameen. Quotes like yours truly make my photography meaningful and sharable. Thank you Sameen … Your kind words really touch me. 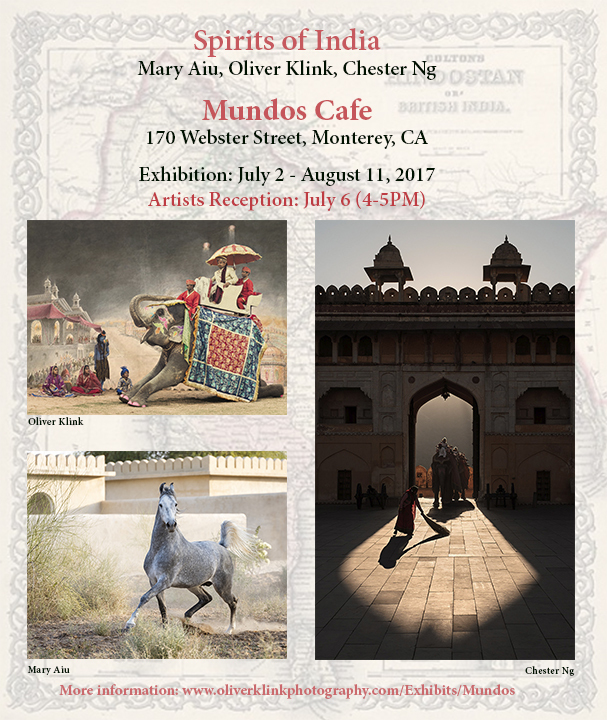 Three of us fine art photographers, member of the Center for Photography Art (Carmel) and the ImageMakers (Monterey) are starting an exciting photography exhibit on July 2 at Mundos Cafe in Monterey. 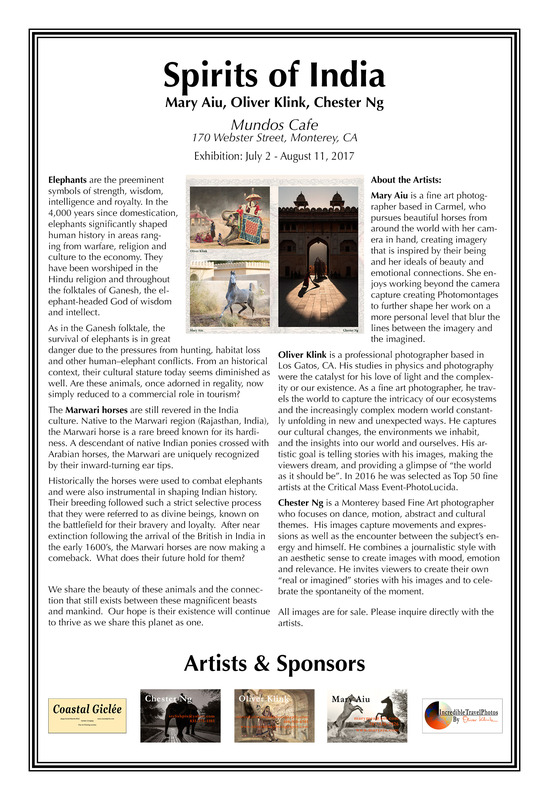 “Spirits of India” features elephants and the Marwari horses. Both animals have shaped the history of India. Are these animals, once adorned in regality, now simply reduced to a commercial role in tourism? 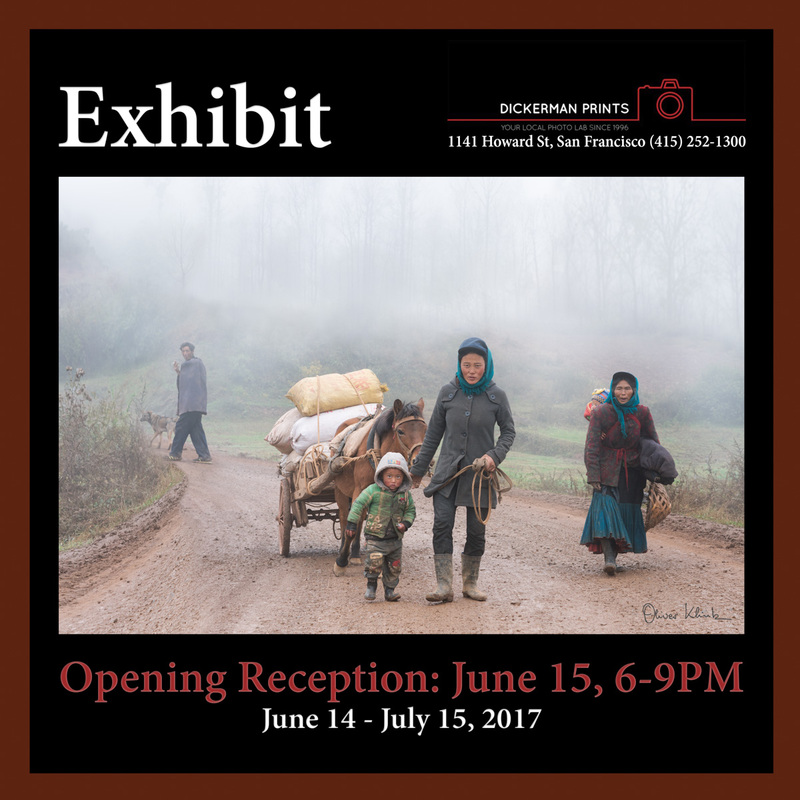 Exhibit at Dickerman Prints Gallery up for another month! 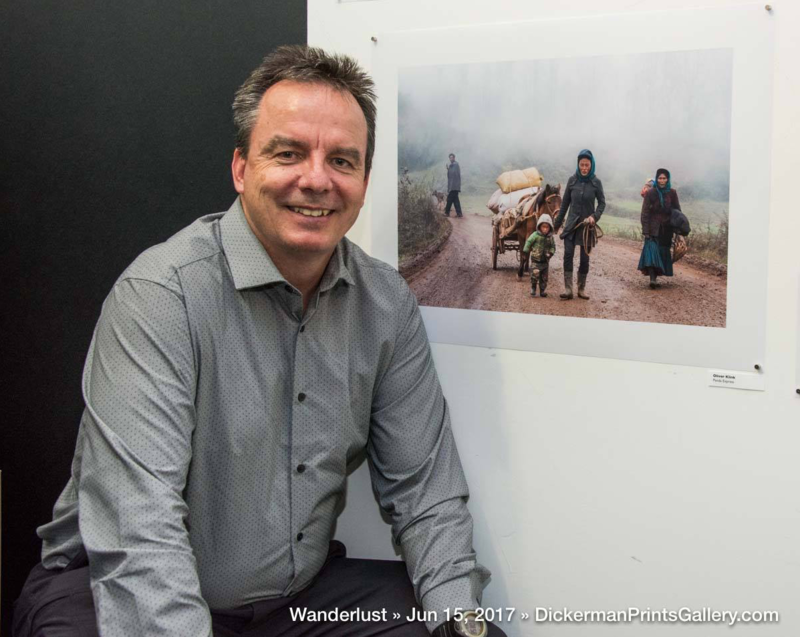 I am proud and honored to be part of the “Wanderlust Show” at the Dickerman Prints Gallery. This group show is truly inspiring! When you see the show in person, you will also enjoy the quality of the printing. Seth Dickerman truly did an amazing job printing such a wide range of images. My image is titled “Panda Express”. I photographed it in 2016 in the remote province of Sichuan, China. The people belong to the poorest minority, called the Yi. Their life is mesmerizing and true to the earth. The show is up for another month …. Don’t miss it. 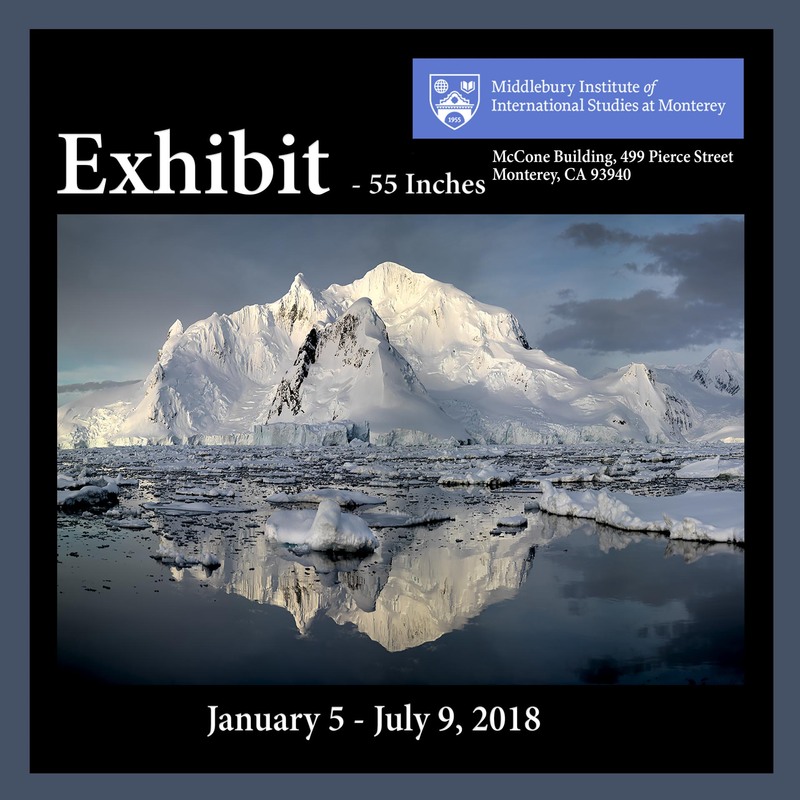 I was invited to present my project “Consequences” at the Asian Art Society of Monterey Bay. The room was packed. “Tonight was one of the best programs!! Thank you for arranging it for us. I was blown away with his technique. 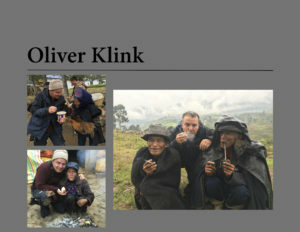 Oliver is a phenominal artist……………..I want to see his book and more of his pictures” – Betty C.
“Thank you so much for your beautiful presentation last night. Everyone loved it, and wants you to return with photos of India, when they are ready. We can hardly wait! The beauty, composition and detail in the images were truly amazing! And your dedication to your craft…backpacking for 3 days to reach a remote village, waiting for 7 or 9 hours (from your presentation at our Rotary Club) to get the photo of the two goats fighting, and so many other examples, prove you are the top in the photography world.” – Jean H.
” Oliver: Just wanted to say how inspired I was by your presentation last night at Hacienda Carmel. I was delighted to find an email in my mailbox today as a follow up. Hope our path will cross again.” Phyllis M.
The “Consequences” portfolio earned me to be selected as the Top 50 fine artist at Critical Mass-PhotoLucida in 2016, around the world press coverages (see old posts on this blog), and many exhibits. 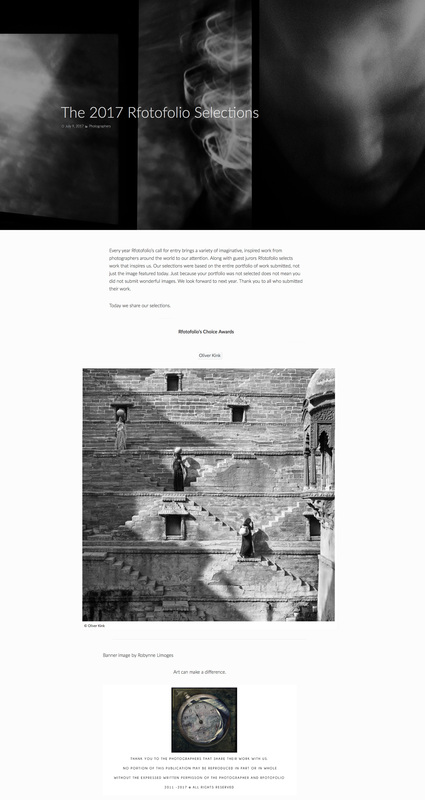 I am very excited to announced that I have been selected to present at the Open Show/StreetFoto Festival on June 8th. OpenShow is a worldwide organization, which mission is to create a powerful feedback loop between the public, partner organizations and creators (photographers, filmmakers and multimedia producers). You can find more about OpenShow here. I will present my work on “Consequences”, which got me selected as Top 50 fine art photographers by Critical Mass-PhotoLucida in 2016. The project addresses the current threats to natural and cultural diversity, sites where modernity, tradition, and wild lands collide. It is an elegy for what is vanishing and a celebration of those cultures on the fringe of modern society resilient enough to maintain their vibrance. As we drift toward a blandly amorphous, generic world, as cultures disappear and life becomes more uniform, we as a people and a species, and Earth itself, are deeply impoverished. 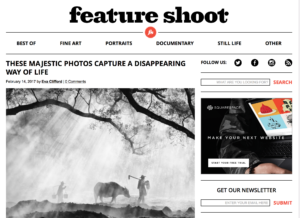 The images take the viewer on a roller coaster ride of aesthetic of disappearance, with hope that the fading traditions are not permanent and irreversible. Join me June 8 at 6PM at the Harvey Milk PhotoCenter, San Francisco. For some, wanderlust manifests itself as an unquenchable thirst to explore life beyond your comfort zone. For others, it’s as simple as reading a book, taking a walk at lunch or going left instead of a right on the way to work. Wherever your wanderlust takes you – by foot, pedal, engine or “other” – we want to see it! Group show featuring Al Brydon, Annie Wilson, Marcus Desieno, Erin Walker Anderson, Oliver Klink, Pete Rosos, Rebecca Martinez among others.